We are delighted to welcome back to our blog, author, Sue Wilkes. Sue is the author of several history and genealogy titles. 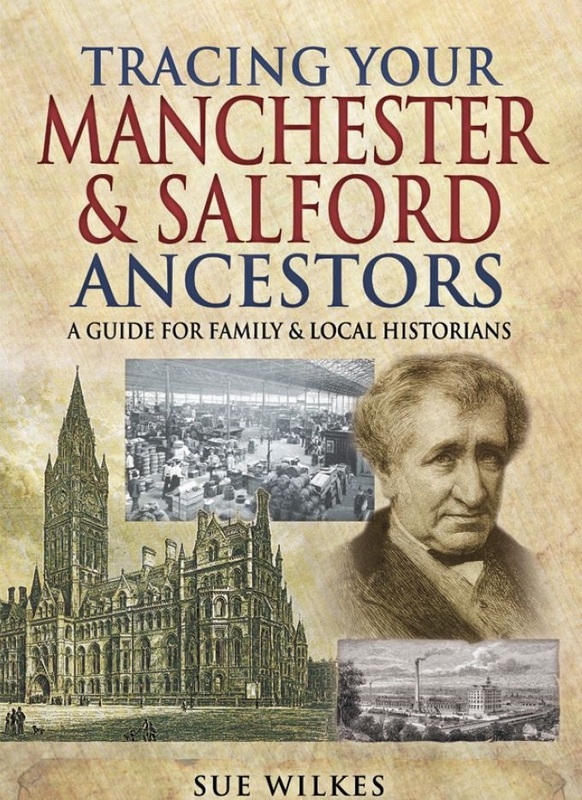 Her latest book is Tracing Your Manchester and Salford Ancestors. As well as being an author, Sue, also hosts two great blogs which you might wish to check out – Sue Wilkes and A Visitor’s Guide to Jane Austen’s England. Late Georgian Manchester was a buzzing hive of industry thanks to its canal and road links. People flocked to work in its textile factories. In about 1816, it took mail-coaches about thirty hours to travel from London to Manchester. But this was no provincial backwater; it had thriving religious and cultural institutions. Interior of Manchester Collegiate Church. Gallery of Engravings, Vol. II, (Fisher, Son & Co., c.1845). The Collegiate Church (later the Cathedral) was the town’s main place of worship. It was renowned for the mass baptisms and marriages which took place regularly there (because people had to pay extra fees if these ceremonies were carried out in other local churches). But other denominations had recently built their own places of worship. Roman Catholics had two chapels (Rook St, (1774) and Mulberry St (1794)). The Dissenters had had a chapel in Cross St since 1693 (nearly destroyed by a mob in the early 18th century), which had been extended in 1788. The Methodists had a large chapel in Oldham St (mostly funded by William Brocklehurst), along with several other chapels in the area, including one at Gravel Lane in Salford. At this date Manchester only had a small Jewish population, who worshipped at the Synagogue in Long Millgate; they had a burial ground in Pendleton, near St Thomas’s Chapel. The Infirmary, Dispensary, Lunatic Hospital and Asylum. J. Aston, A Picture of Manchester, c.1819. Courtesy Google Books. The famous Literary and Philosophical Society (1781) met regularly at George St. Members had to be elected to the Society, which had a whopping 2-guinea entrance fee, and a guinea yearly membership fee. Its members included the famous scientist John Dalton. A News Room and Library (the Portico) opened in 1805; four years later, the New Exchange opened, where businessmen and merchants met to transact their business dealings. The town had had a theatre since 1753 (possibly earlier), and stars from the London theatres regularly trod the boards here. The first Theatre Royal (in Spring Gardens) burned down in 1789; the new Theatre Royal opened in Fountain St in 1807, but like many other establishments, it was bedevilled by financial problems. By 1816 the Theatre Royal had ‘elegant saloons’ in the boxes (4s admission), or you could pay one shilling to sit in the gallery. Regency gentlemen and belles graced the ballroom at the Assembly Rooms in Mosley Street, with its glittering chandeliers and mirrors. Dancers refreshed themselves in the elegant tea-room. Regular concerts were held at the Assembly Rooms. The Sir Ralph Abercromby pub, believed to be the only surviving structure from the era of Peterloo close to the site of the massacre. © Sue Wilkes. Manchester was also home to many charities such as schools, Sunday schools, and hospitals. Did you know that Manchester had its own ‘spa’ at the end of the Infirmary Walks? Well-to-do locals could subscribe to the Public Baths supplied by a local spring; it cost half a guinea for a year’s subscription. Bathers could enjoy the Cold Bath, Hot or Vapour Bath, or the ‘Matlock or Buxton’ Bath. St Ann’s Church, consecrated in 1712. © Sue Wilkes. But Manchester had its darker side. There was a recently built prison in Salford (the New Bailey), which opened in 1790 and replaced the former unsanitary House of Correction at Hunt’s Bank. Weaver Samuel Bamford and the orator Henry Hunt were imprisoned at the New Bailey following their arrest in 1819. They had been attending at a mass meeting at St Peter’s Field to campaign for parliamentary reform. Several people were killed when local magistrates sent yeomanry cavalry into the crowd to arrest Henry Hunt – the infamous ‘Peterloo massacre’. ‘Manchester Heroes’. Contemporary print showing the Peterloo Massacre, courtesy Library of Congress. Sue, this sounds like a fascinating book! Manchester has been a subject of considerable research on my part, at least what was happening there in 1819. I just began a novel the first scene of which is the massacre that occurred on August 16, 1819. I have a question. I assume Manchester’s sky had smoke from the factories but I’ve not been able to find statements reflecting that earlier than the Victorian era. Would the ir be smoke and, if yes, would it have been visible from St. Peter’s Field that day? I know the day was otherwise sunny and warm. Hi Regan, many thanks for your comment. Robert Southey visited Manchester in the early 1800s and he mentions the people’s houses being blackened by smoke http://archive.org/stream/lettersfromengla02soutuoft#page/96/mode/2up. You would most likely have been able to see the factory smoke from St Peter’s Field – this 1808 map shows how tightly packed the town centre was already by this date, http://bit.ly/2rMRICn. Hope this helps! Thanks so much Sue. Say, do you happen to know what the population of Manchester was in 1819? I’ve tried to find out but the numbers (even from serious academic articles) are all over the place from 100K to 400K. Hi Regan, what an interesting question! One reason why the numbers may vary so much is because it depends on whether one includes all Manchester’s adjoining townships. The most accurate figures either side of Peterloo will be the 1811 and 1821 censuses. Joseph Aston, A Picture of Manchester, (http://bit.ly/2sSC6NV) quotes from the 1821 census (p.34) and gives a total of 186,996. The Vision of Britain website has a graph http://www.visionofbritain.org.uk/unit/10033007/cube/TOT_POP. Wheeler’s History of Manchester also includes census tables through time, http://bit.ly/2szKOh3. Thanks so much, Sue. I think I had seen those sources and others, too. At least now I know why the numbers vary so. I think I’ll stick with “well over one hundred thousand”. The graph isn’t helpful, is it? It suggested the population then was only 100,000. I found “A Picture of Manchester” by Joseph Aston an interesting perspective on the Peterloo Massacre. Obviously it is the Crown’s perspective and not that of the people, who were desparately poor and suffering with unfair laws and no representation in Parliament. Aston could not see Henry Hunt as the voice of the people, which he was. After all, 60,000 people came to hear him according to the records I read. As I did my research, I found myself getting angry on behalf of the government’s uncaring attitude toward Manchester. I agree the graph isn’t brilliant – I included it really to show that 400,000 was perhaps an over the top estimate. There were contemporaries who were angry about the government’s uncaring attitude, too – you might like to read (if you haven’t already) Archibald Prentice’s Historical Sketches and Recollections http://bit.ly/2rUbITJ, and Samuel Bamford’s autobiography, http://gerald-massey.org.uk/bamford/b_radical_index.htm. Great resources, Sue. Thank you so much. I will take a look. And I agree that 400K is unrealistic but I did see it in print. Perhaps they had in mind the surrounding population. I also read about the horror those in London experienced upon reading about the slaughter of innocents, the Prince Regent’s praise for the soldiers notwithstanding. Hi Regan, many thanks for your comment! Baines’ history of the county in 2 volumes was published a few years after Peterloo http://bit.ly/2t0CHg8 and http://bit.ly/2tyXjJU and has a detailed history of Manchester and gives 108,000 for Manchester township (1821) and 187,000 for the whole parish including the townships. Yes, indeed, a great many people were shocked by Peterloo. The government had little choice but to back the magistrates’ actions, whatever they felt privately. Sue, thanks for the additional resource. I do have to disagree as to your last point, however. The government could have told the truth about what happened that day on St. Peter’s Field and condemned the massacre. To praise those who murdered women and children was worse than the lies they let stand. To imprison Henry Hunt who did nothing to incite violence was a travesty of justice. In doing so, the Prince Regent and Sidmouth, if they ever had any honor, lost it that day. Dear Regan, of course I totally agree that the government *should* have condemned the massacre – the Prince Regent too – but one also has to consider the practical politics of the day. There was no national police force and the government was totally reliant on local magistrates to keep the peace in their area. If ministers didn’t back the magistrates in public (however misguided they may have thought their actions were in private) – they would have had great difficulties when they needed magistrates in other areas to act decisively when civil unrest was threatened. One of the yeomanry cavalry regiments involved – the Cheshire Yeomanry – was also known as the Earl of Chester’s Regiment, and Prinny was the Earl of Chester. So naturally he had to support the soldiers’ actions. The Prince of Regent (and the government) would have been condemned by many of their own class if they didn’t publicly back the magistrates and yeomanry cavalry. Henry Hunt did not incite the violence, but he was a regular thorn in the government’s side, so they would have been very happy to see him behind bars. Sue, I do understand the Crown’s and Sidmouth’s desire to cover themselves. However, I cannot defend hiding the truth and sanctioning the killing of innocent, unarmed people. It was consistent with the Crown’s behavior over the centuries, however, so I suppose there is no surprise here. In the end, it did them no good. The government’s despicable act is remembered even to this day. It was England, after all, where the yeomanry and hussars attacked women and children, not some conquering horde from the Great Steppe. Thanks again, Regan. You might be interested in this – http://www.peterloomassacre.org/ – there is still no proper memorial to the massacre. Wow, Sue. I knew the citizens remembered the event each year but I didn’t know there was a groundswell of support for a memorial. That’s a good thing, I think. Thanks for answering all my questions! Good luch with your scholarly effort! You’re very welcome, Regan! Have a good weekend! Oh, Sue, I meant to tell you I have your book, Regency Spies, and consulted it as one of my sources for my current Regency I’m writing (the one that begins with the Peterloo Massacre!). My hero and his twin brother are two of Sidmouth’s spies, disenchanted after Manchester. Dear Regan, thank you for buying it! I do hope you enjoy reading it! Your novel sounds fascinating – good luck with it!